I have used 2 bottles of Kedi Healthcare ULTRAMEGA together with my son. It's the best. I no longer need Omega-3 or Cod Liver Oil. Kedi I need some more bottles please. I am fully satisfied with the performance of Kedi Healhcare herbal Re-vive product for men. It is a must use by every man that wants to be in control at all times. How can I gain access to distribute Kedi Revive here in Kenya? My name is Mrs. Olayanju Esther, and I am in my mid fifties. I was introduced to Kedi by a friend who told me the business is woth doing compared to the former Network Marketing Business we were in before. So I joined Kedi Healthcare early 2011. Last year April, that is 2012, I was in my bathroom for a bathe when I fell and hit my chest on the floor. Since then, I have been having serious pains. I went to the hospital and it was discovered that I have a lump in my right breast. The anxiety of the news added more to my problem. I was worried that at my age I might end up having breast cancer, but I rejected that thought and decided to test Kedi product. I resolved to use Cordy Active because in one of the weekly lectures that I attended, the lecturer mentioned that Cordy Active has zinc in it. I bought 2 jars of it and was taking 4 capsules of it, twice daily. I was still on my first jar when I noticed that the pains had disappeared, and it was like a dream to me. I decided to wait for a while to observe what was happening before going back to the hospital for re-examination. At the end of it, the Doctor told me that the lump was gone and asked me what product that I was using. I told him of Kedi Healthcare, and I ended up registering the Doctor into Kedi. I came in contact with a man whose 85 year old mother has been suffering from Chronic Ulcer for many years. They had tried so many products without improvement until I introduced them to Gastrifort. The man did not show any keen interest to purchase the product for his mother at first, so I gave him 1 jar of Gastrifort on credit for a try, and I said to myself- 'a single try will convince him'. He later came back to pay me and also purchased more products for his mother. The mother is a free person now. I am confident to recommend Kedi products to my customers. I had an operation long ago due to the enlargement of the testicles. The operation was successful, but after sometime, the inflamation began again and I was so confused. My meeting with a Kedi Top Distributor who introduced me to Kedi Vigor Essential was divine. I experienced changes when I started using the product, and I am relieved now. Sincerely speaking, Kedi products work. I am a member of the Nigeria Police Force attached to Ebonyi State Command. I came for a Promotional Course at Ikeja, Lagos, and fortunately I met with a Kedi Distributor who introduced Vigor Essential, Revive, and Reishi to me. I bought the products and also bought the recommended products for my wife. To my surprise, my wife got pregnant and on the 23rd of June, 2013, she gave birth to a very beautiful baby girl after 12 years of marriage. 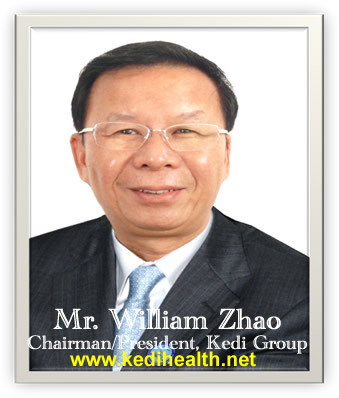 I am so impressed by the wonders of Kedi Healthcare Products. A girl was having too much of dark blood and pains during mentruation. I gave Reishi to her and the whole problem is over now. Kedi products are superb and excellent! When I joined Kedi, I took all the products except Revive which is meant for men only. Today, I feel wonderful, fulfilled, happy, and also proud to be part of Kedi Network Business. I have been billed for an operation to cut off hemorroid of 2 - 3 inches. This ailment caused me so much pain. I hardly sit down, and insomnia became my portion. I also vomit anything that I eat and my skin lacked moisture. I recovered my health the moment I was introduced to Constilease. Operation was cancelled. It was a miracle, I can now sit down, sleep very well, and eat without vomiting. My skin is also regaining moisture now. I was diagnosed to have an oral infection in the right part of my mouth. I went for an oral surgery but I was still uncomfortable after the surgery. I registered as a Kedi distributor and was priviledged to take Golden Hypha. There was an instant relieve in my mouth after taking this product, and since then my mouth has been in perfect state of health. I am now a Kedi Ambassador. I never believed it could act so fast. A friend of mine had staphylococcus aureus for over 5 years which had weakened his sexual system and his wife was also infected. They had used several medications from serveral hospitals and Doctors to no avail. But when I had introduced KEDI Reishi product to them, they took it and startd seeing improvement in weeks. After 6 weeks later, they went for a lab test and behold it was negative, they waited for a month later and repeated the test again to be sure it was gone and the result of the test was still negative. Thank God they are now healthy and happy, infact they have joined KEDI products distribution now as a testimony. Why not have a testimony yourself? Check our wide range of safe, natural, and highly effective health products that will sure give you a testimony in that area of health challenge.